Greetings to Everyone! 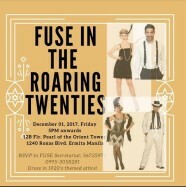 It is our honor to invite you to attend our FUSE Christmas Party at the 12-B Pearl of the Orient Tower Condominium, 1240 Roxas Blvd. Ermita, Manila on December 01, 2017 at 5:00 p.m. (registration) It is Christmas time once again and we can not let this season pass without seeing you.